Obtain a more slender neck with total fat loss. If you're neck is a bit too flabby for comfort, help firm it with a smart workout strategy. Just don't expect to pluck the fat off with neck exercises alone; while a number of strength-training moves will tone your neck muscles, none of them will trim the flab. Achieving a smaller neck requires good, old-fashioned weight loss, which means that dietary changes and aerobic exercise should be high on your to-do list. Get between half an hour and an hour of aerobic activity five days per week. Cardio is the best exercise for losing body fat because it shreds calories fast -- and the more intense your cardio, the greater the burn. Top choices include running at 8 mph and jumping rope, both of which burn 861 calories per hour for a 160-pound woman. While these heart-pounding activities are reserved for the physically fit, beginning and intermediate exercisers can get their cardio in by power walking, dancing vigorously or roller skating. Perform supermans to sculpt the back of your neck and tone your core, to boot. On a yoga mat or towel, lie on your stomach with your arms and legs outstretched; your toes should point toward the wall behind you and your palms should face each other. Align your neck with the rest of your spine so that your eyes face the floor. Lift your arms and legs a few inches from the ground, hold the position for several seconds and lower slowly back down. Repeat eight to 12 times, rest and repeat. Perform shoulder shrugs. These ultra-simple moves work the sides and back of your neck along with -- naturally -- your shoulders. Stand holding a dumbbell, water bottle or soup can in each hand. Dangle your arms by your sides with your palms facing the sides of your thighs, and shrug your shoulders as high as possible. Hold for a second, lower your shoulders slowly and repeat 12 times. Perform two to three sets total. 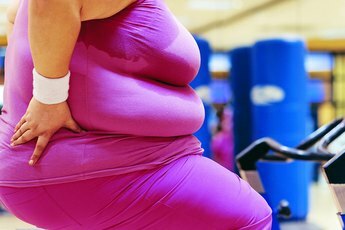 Reduce calories to 1,200 per day, the amount MayoClinic.com recommends for women under 250 pounds who want to lose weight. Ensure proper nutrition while you eat less by skipping fast food and fatty, sugary snacks in exchange for lean, unprocessed foods. Go for dark, leafy greens, carrots, bell peppers squash, tomatoes, apples, berries and citrus -- the more colorful your plate, the better. Choose healthy, whole carbs like brown rice and whole-wheat bread, and get protein from low-cal sources like tofu and salmon. For balance, perform strength-training exercises for all major muscle groups: arms, legs, back, chest, stomach and hips. If you're new to exercise, see a doctor and ease slowly into a new routine.